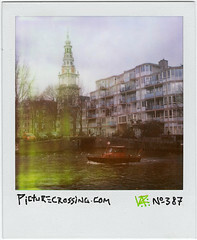 picturecrossing No.387 (SX No.344) A fireboat on a canal in Amsterdam near Jodenbreestraat. The Zuiderkurk is seen in the distance. Interesting greenish haze from the expired film. 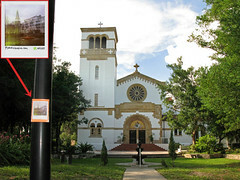 LEFT: on 6/14/10 on a light post just in front of the Saint Leo Abbey chapel on the campus of Saint Leo University, in Saint Leo, Florida while visiting there with my mother who likes to buy grapefruit from their orchard. Click the photo below to see where it was left. "Hello. I found your picturecrossing photo #387 on a lamp post just outside the Saint Leo Abbey Church in Saint Leo, FL. (I) frequently walk down that path. In fact, I had walked past your photo quite a few times and hardly paid attention to it, just assuming it was some type of notice or paperwork for the plant operations department. Yesterday, my curiosity finally got the best of me and I decided to check it out. What a nice surprise it was to find an interesting photo instead of a boring notice! Will you please let me know where the photo was taken and if its location was 'crossed' with a photo of the Saint Leo campus?